Updated Wednesday September 6, 2017 by Richard Mucci. Thinking of asking someone to sponsor? Download a sponsorship flyer to hand out. Click here or download the flyer below. Welcome to the Elmwood Park Bombers online sponsorship registration system. Every successful athletic program depends heavily upon the support of alumni, local businesses and the surrounding community. The Elmwood Park Bombers are no different. The Bombers invite you and your company to become a Corporate Sponsor for the 2016 season. This will be critical in not only helping us to continue building a formidable online presence, but will also help with operational expenses like equipment, uniforms, child insurance packages, etc. 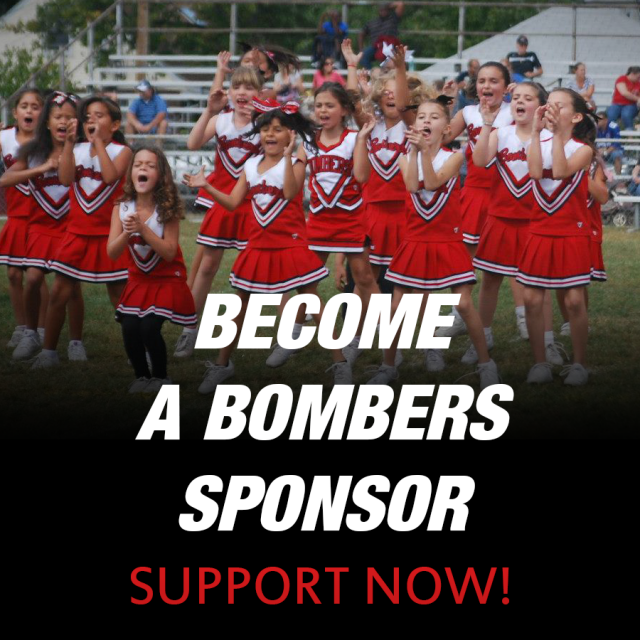 Sponsoring your Bombers football and cheerleading organization makes Elmwood Park a happier, healthier community by allowing our children to take part in the spirit of organized football and cheer. Your support is greatly appreciated and will be recognized by others by letting them know your heart is with the Bombers organization for the upcoming season and beyond. Your support is this a great way to advertise and market your business and is a TREMENDOUS opportunity to help these young men and women. The Elmwood Park Bombers website and other Bombers operational services could not happen without the generous support of our sponsors and we are truly thankful for your support and contributions to make this possible. Your company logo and contact information on the sponsor page of epbombers.com. Your company logo displayed as a banner on the front page of epbombers.com. A (5’ x 3’) banner displayed at all Bombers home games along the home team fence. A commemorative plaque acknowledging your sponsorship. A (8’ x 3’) banner displayed at all Bombers home games along the home team fence. In-Game announcements of sponsorship at the start of all Bombers home games. Want to hand out a flyer to a potential sponsor?